STOP HS2 | HS2 expected to have an effect on local elections. HS2 expected to have an effect on local elections. Banners like this have been up in the area around Chequers for a few years now. HS2 is set to have a bearing on local elections on May 2nd, according to campaigners along the route. 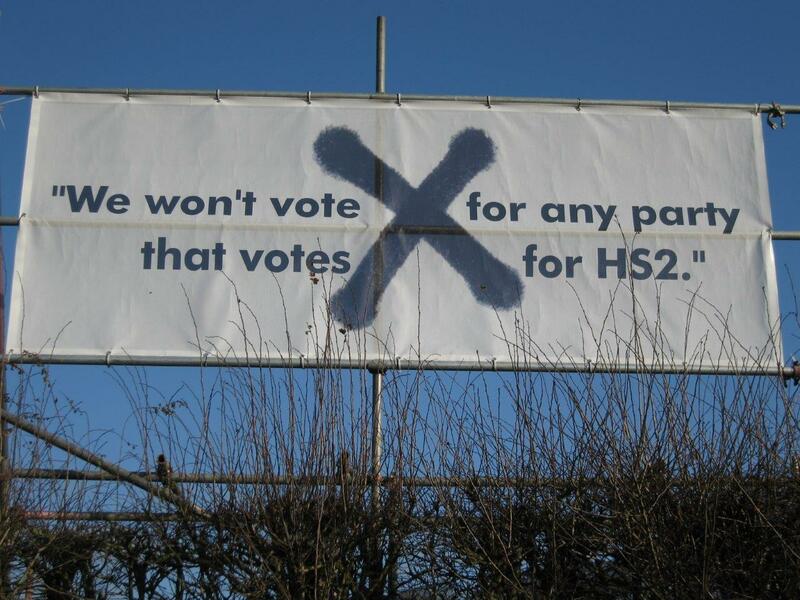 While almost all the local authorities along the planned route for Stage 1 have come out in opposition to HS2 and formed the campaign group 51m, many grassroots campaigners against the project are backing the slogan “we won’t vote for any party that supports HS2“. Whilst the three biggest parties in England support HS2, both The Green Party and UKIP are calling for HS2 to be scrapped. HS2 is expected to be more of an issue in the areas affected by Stage 1 of the proposals, as there are still many since the announcement 12 weeks ago of Stage 2 who are unaware of what it would mean, but some areas are becoming more mobilised, and the upcoming elections are helping focus that awareness. “People along the route of HS2 are very aware that their local services are being cut. That’s things like local buses, libraries and health centres. Local people, especially the elderly, the young and the people on low incomes, rely heavily on these services. Meanwhile, the government shows how out of touch with these needs they are, by planning a £41billion pound spend on a railway which will be used by the richest in society. I’m not sure what this has to do with HS2 at all? Maybe comments based on facts and knowledge, as opposed to those relating to the attempts to deport someone, would be more useful on a site about a proposed railway?